I was trying to hide behind stories, to construct fictions, instead of facing facts. I asked myself: how are facts faced? I knew the answer: facts are faced with evidence, with data, with numbers. Fiction cannot be outnumbered; it cannot be proved. But facts, yes, I have known all my working life, I have built my business on it — facts can be proved. 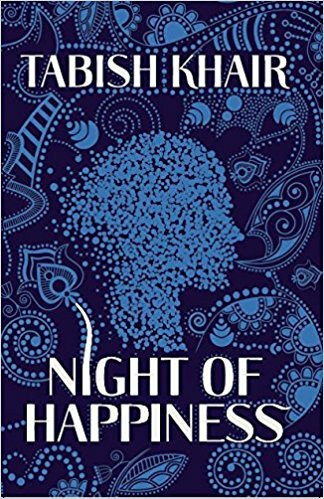 Tabish Khair’s Night of Happiness is about Anil Mehrotra, a businessman, and his right hand man, Ahmed. Anil Mehrotra relies completely on Ahmed irrespective of whether it was day or night or a holiday. The added advantage for Anil was that Ahmed was a polyglot and the astute businessman Anil knew “People are generous when you speak to them in their language. They are nicer, happier; ‘Their hearts unlock a room for you in their distant homes.’ ” This was an asset in the import/export business. Night of Happiness is about Anil trying to find out more about Ahmed’s past life particularly after one stormy night of working late in the office Anil had offered to drop Ahmed home. Ahmed invites Anil to have tea and maida ka halwa ( a sweet dish made out of flour and sugar), a special dish made on Shaab-e-baraat or “Night of Happiness”– a day when the departed souls are remembered by Muslims, much like other faiths too set aside a similar period of time to honour their dead such as All Souls Day for the Christians or the period of Shraadh for the Hindus or Dia de los Muertos ( Day of the Dead) as is observed in Mexico. Anil has an unnerving experience at Ahmed’s home and decides to investigate further. He hires a private detective to dig up facts about Ahmed’s past. During the course of investigation a string of details emerge that Ahmed had never hinted at in all the years he worked with Anil Mehrotra. The story itself is crafted in a manner that distances the author from the sentiments being expressed in the story as the narrator says he found the manuscript in a hotel drawer and proceeds to read it. Be that as it may the first person narrative of the makes the plot very powerful and the pace sharp. Ostensibly it is a story about Anil trying to ferret out facts about his trusted colleague and yet it is thinly veiled fiction about a dialogue between Hindus and Muslims calling out the popular held myths about a Muslim. It rings so true because it can very well be a real conversation. Both the Hindu narrator of the manuscript, Anil Mehrotra, and Ahmed, a Muslim, are portrayed sensitively. While the investigator works like the chorus of a Sophoclean drama supplying the necessary information to the main action while gently rebutting Mehrotra’s assumptions of Ahmed’s life. The further distancing of the authorial voice by presenting facts from the investigator’s report further lulls the reader into accepting the “make-believe world” of the “literary thriller”. Whereas Night of Happiness is much more than that! For one it is using fiction to remind people of the pogrom orchestrated in living memory and how its long shadow is still cast upon modern India. It’s within this century and less than a generation old but sufficiently long for many people, particularly the young and the diaspora, to have conveniently forgotten about it. More likely been brought up in an ahistorical environment so these dastardly facts have no impact. Tabish Khair is a well-known novelist but is also increasingly known for his opinion pieces published regularly in the Indian newspaper Hindu. These are well-argued, thoroughly researched, thought-provoking commentaries on socio-political events playing out in different parts of the world. It is quite possible that much of the preliminary work involved for these articles laid the bedrock of Night of Happiness. 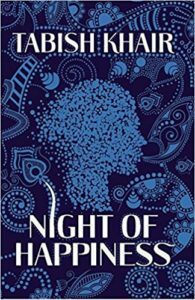 Certainly the publication of Night of Happiness close on the heels of the widely acclaimed novel by Mohsin Hamid Exit West raises the bar of literary fiction by many notches as both novels are able to focus on the horrific sectarian violence sweeping through the world. It is as if lessons from history were never learned. Both the authors, Tabish Khair and Mohsin Hamid, are writers of subcontinent origin who are also widely respected on the global literary stage. So when such powerful literary icons raise disturbing questions of a socio-political nature through their art, they must be heard. Tabish Khair’s Night of Happiness begs the question if it is really “Art for Art’s Sake”? Whatever the reasons for the existence of Night of Happiness, it is unputdownable.